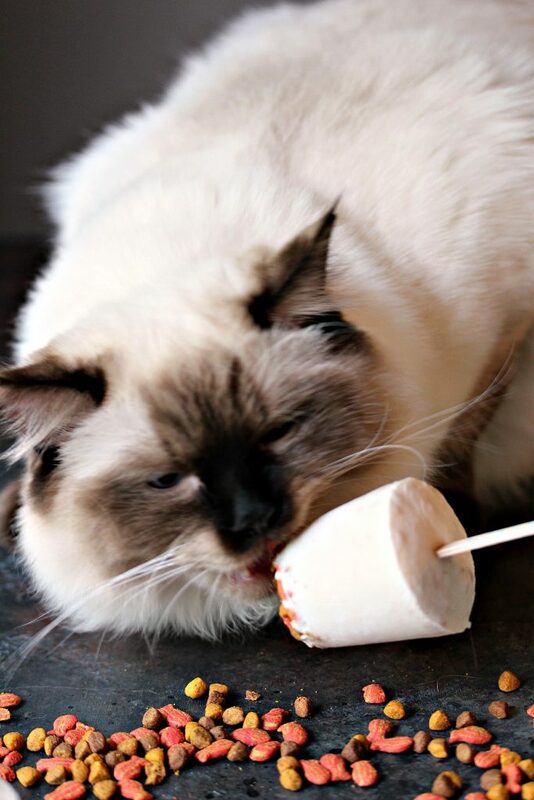 These refreshing popsicles are perfect for summer, and will let your cat cool off in style. 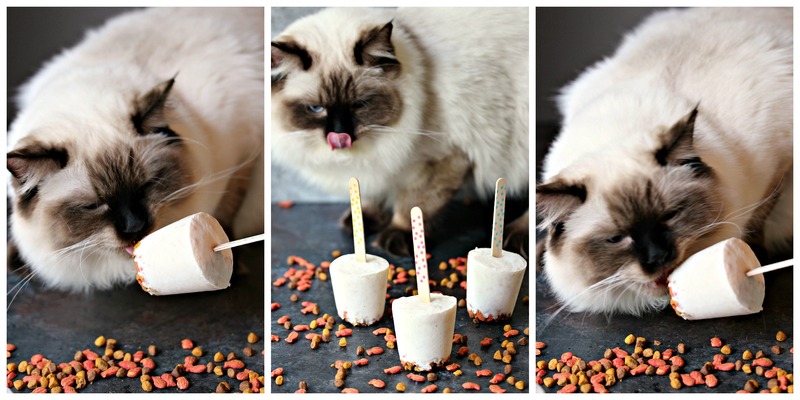 Whip up a batch of these super easy 3 ingredient Cat-Friendly Banana Meowsicles today! 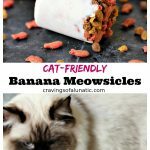 Click here to PIN these Cat-Friendly Banana Meowsicles! I’m just going to start this post by saying this is was, by far, the most fun I’ve ever had making a recipe and taking photos for my blog. The whole process was an absolute riot, from start to finish. We had such a blast working on this recipe! Anyone who knows me well knows that I’m a huge pet person. I love my pets. They’re family to me. I spoil them rotten and love every minute of it. They deserve to be spoiled. They keep me sane and mellow on a daily basis. I’d be lost without them. We have 2 Arabian horses, 2 dogs, 1 Parakeet, and 4 Ragdoll cats. My home is basically a zoo. I’m completely okay with that. Having that many pets is complete chaos most days, but it’s also so rewarding and fun. There’s never a dull moment. I love all my pets, but I have a serious attachment to my cats. They follow me around like puppies, day in and day out. They go up and down the stairs while I clean every day. They help me make the bed, and by help I mean it takes 10 x as long. Everything I do on a daily basis is done with at least 2 or 3 cats trotting behind me. I love the companionship. They like to play fetch like dogs, one of them loves to play peekaboo, and another likes to sit near me at all times. Most of the time they all get along quite well. Our two youngest cats are like two peas in a pod. They do everything together. They eat together, they nap together, and they play together. They chase each other around the house like lunatics. I wouldn’t trade the chaos for anything in the world. I’d be lost without them. They have such huge personalities. Ragdolls are known to be very dog-like, so most days I feel like I have 6 dogs hanging out with me every single day. 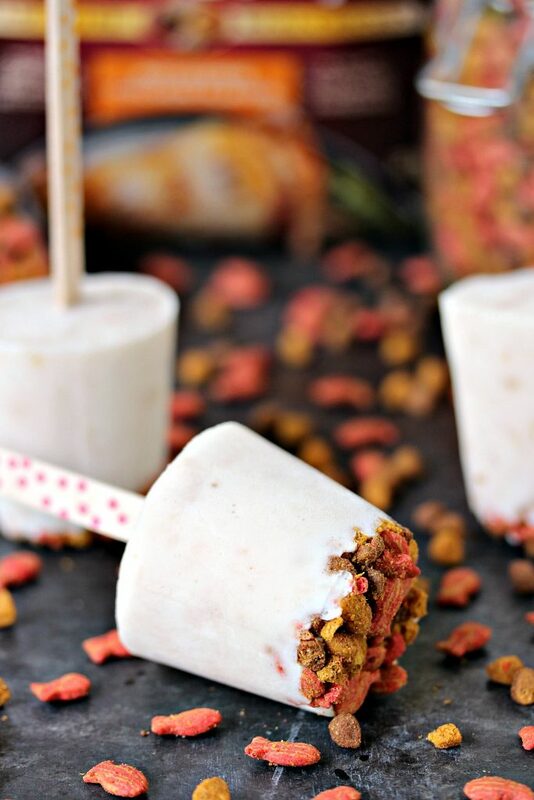 If you’re a pet lover you know how fun it is to make treats for them. I love making special snacks for my kitties. 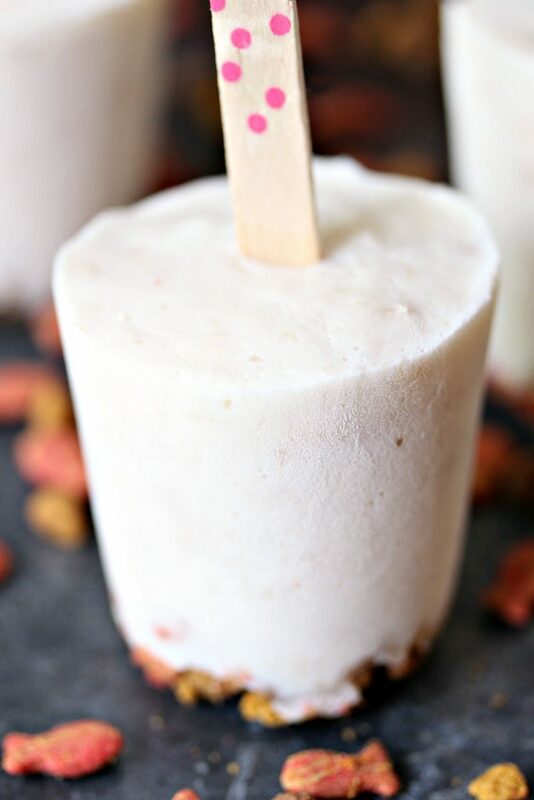 Ours love bananas so I make banana pops for them in summer. They all love them, with the exception of Castiel. 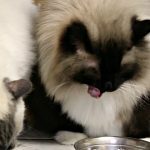 This recipe combines their love of bananas and cat food. 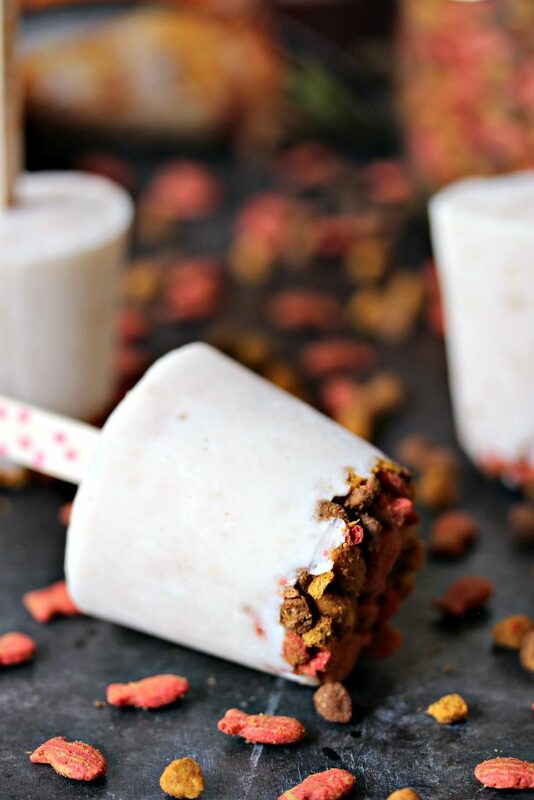 I crushed dry cat food to make a fun crunchy crust on the popsicles. The kitties loved them. They gobbled them up so darn fast and we barely had time to take photos. Spike (featured below) is our oldest kitty. He is 16 years old. He has been around forever and seen us through a lot of ups and down in life. He loves to beg for water, even when there’s fresh water already in his bowl. He always drinks first and is the king of the castle. Spark (featured below) is our second oldest kitty. He is 12 years old and was a gift for my daughter for a monumental life event. He was the tiniest little kitten and so stinking cute. Now he’s a giant fur-ball who talks non-stop. This cat is seriously vocal. Next up is Castiel (featured below), he is 5 years old and a total love-bug. He is the sweetest cat you could ever meet. He’s very sensitive and sweet. He loves to be carried around draped over my daughter’s shoulder. It’s the weirdest thing but he loves it. Our newest addition joined us this year. His name is Dixon (featured below) and he’s 6 months old. This not-so-little man is just the funniest kitty in the world. He’s my best buddy and I love him dearly. Dixon, aka Bubba, goes everywhere with me. He’s my sidekick. Before you make this be sure to read the instructions properly. 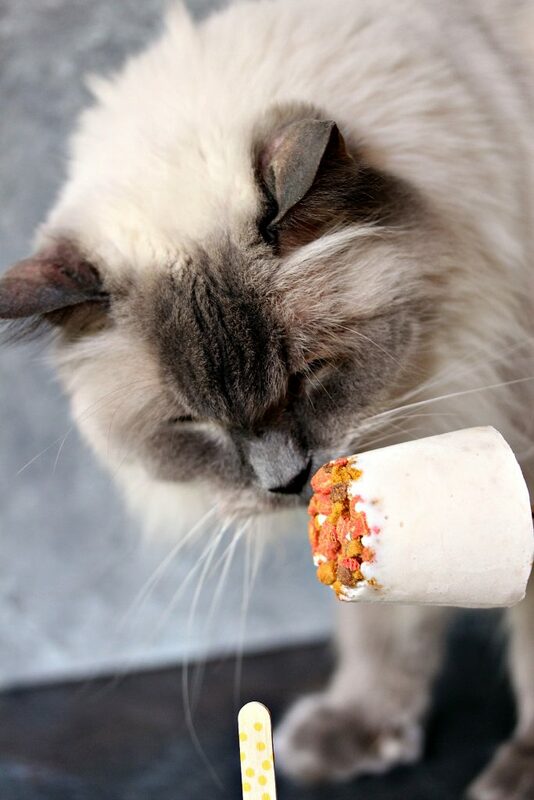 Most adult cats are lactose intolerant. So be sure to test yogurt with your cats first. For safety and health reasons always be sure your cat is not lactose intolerant before giving them yogurt. If they are lactose intolerant you can still make this recipe. Just use Cat Milk instead. You can purchase it at most pet stores and vets. Get the adult version if you adult cats, not the kitten milk. Unless you have a kitten, then the kitten formula is okay. Stay tuned for another dog-friendly recipe coming soon. I have tons of great photos of our dogs to share with you! Plus I have a fun announcement regarding our dogs that I’ve been wanting to share for some time now. 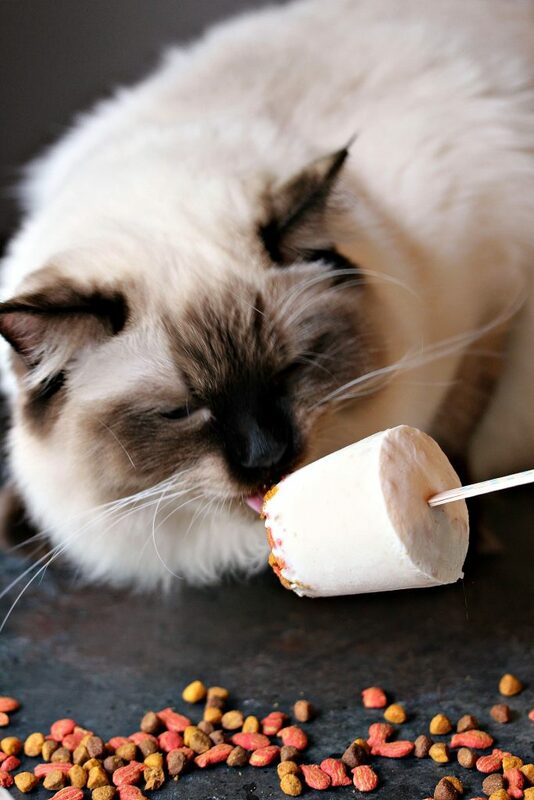 Now head into kitchen and whip up a batch of these cute popsicles for you cat. These are also dog-friendly, just in case you have both dogs and cats. Combine the mashed bananas and yogurt, or cat milk, in a bowl and mix until combined. The mixture should be smooth. Crush the cat food. Place a small amount in each mini cup. 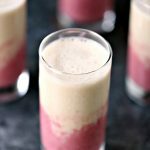 This recipe will make 8 to 12 depending on how you fill your cups. Scoop the banana mixture evenly into all the cups. Tap to smooth out the top and release any air bubbles. Place each one in the freezer overnight. Serve with a big old cat loving smile! If your cat is lactose intolerant please do not use the yogurt. 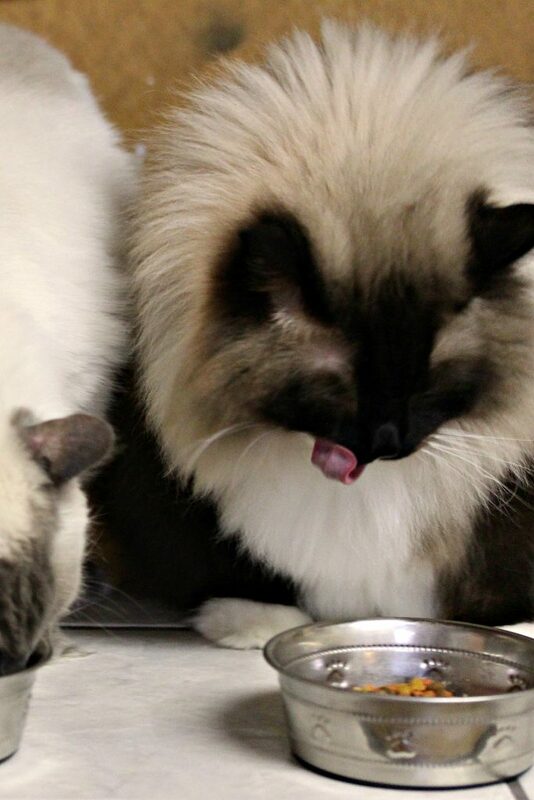 Our cats love and tolerate yogurt well. But many adult cats do not because the are lactose intolerant. In that case use Cat Milk that you can purchase at your local vet, or pet store. Buy the adult formula, not the kitten formula. The kitten formula should only be used for kittens. Make these today. Your cat will thank you tomorrow! 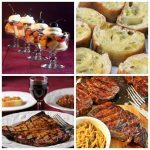 For more fabulous recipes be sure to check out my recipe index. You’ll find easy recipes that are perfect for cooks of any skill level. Be sure to follow me on Pinterest to see what I’m pinning every day. You should also follow me on Instagram too. 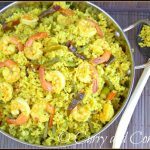 I share recipes, and pet photos there. So it’s fun to follow. Awe, thanks Ashley. We had so much fun shooting the photos for this blog post. Such a hilarious day. OMG, such an adorable cat you have! I love cat too. And how nice of you making this recipe for your pet. Thanks so much. We love all our kitties. Thanks so much Lauren. We had a riot the day we took the photos. All but one were into it. The one wasn’t having any of it. Lol. Can’t wait to share the dog treats next. Aren’t they a riot when they “help” us do chores? Lol! Kitty obsessed folks are the best folks. Hope your cat loves them. OMG, I love this post so much! I too am a hopeless cat person. I have three, and from your description I think one of mine is a closeted ragdoll (he’s actually a short-haired tuxedo). But the behavior completely fits, haha! I wonder if any of mine would appreciate such a thoughtful treat like yours. Maybe not, they are such brats (my fault – I created the monsters!). I love meeting other cat people too. Kitties just make life so much better. I adore tuxedo cats. Maybe he’s got some ragdoll blood in his line somewhere. You never know. Thanks so much. We love them. I’d get another one but I think my hubby might actually lose his mind if I do that. Ha. It’s like a zoo here. 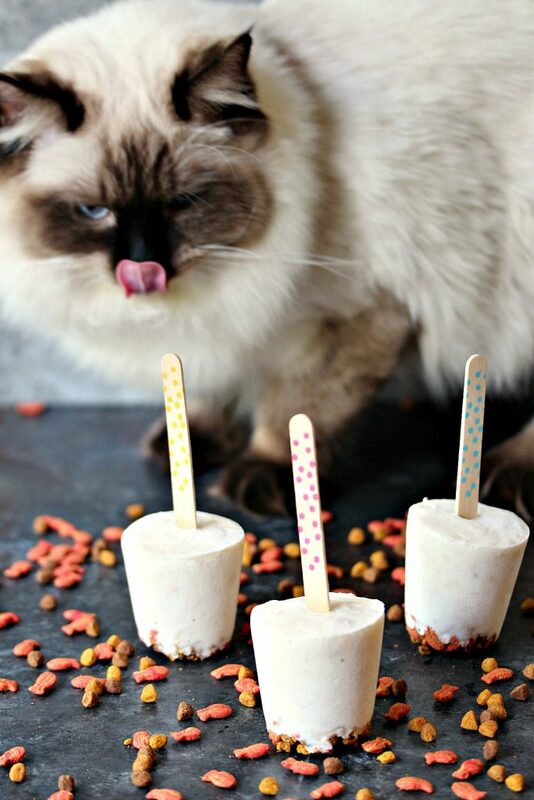 What beautiful cats, and what a creative treat for them! 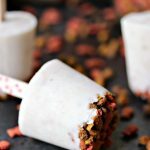 I’ve never heard of cat milk (I don’t have cats), but I’m definitely sharing this recipe with my friends! My mother-in-law has some cats that deserve to be pampered! I need to pass this on to her! She would love this. Hope she gets a chance to make these. You totally could. Sugar would love them. I’ve got a pup-friendly version coming up. Just haven’t had a minute to edit them. School starts back Thursday so I’ll be able to get into my work routine again. Not going to lie, I’ve really enjoyed the dialled back hours this summer. it’s been nice not working as much. We’re totally in love with our pets too! They are just like our kids! No kitty cats here but I have friends with cats! Sending them to them asap! Pets just make life better. We’re pretty blessed to have such a motley crew. Ah-choo! :o) I allergic to kitties, so none for me. But my dogs would love this, so maybe I’ll have to try it out on them! Bummer. One of my besties is allergic too. 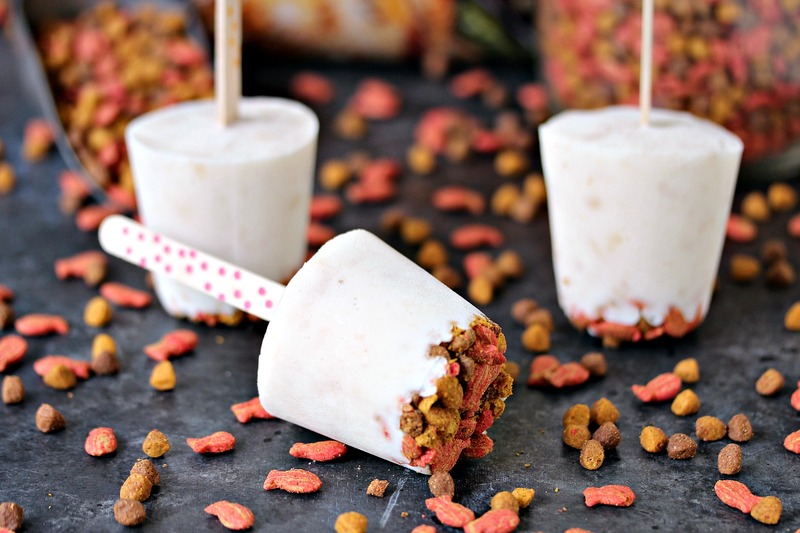 You should totally make this for your pups. I have a pup-friendly version coming soon. Aww. What a fun post! I’ve never had a pet but if I did, I like to think I’d make them treats like this. 🙂 Love all the cat pictures! Thanks Erin. I had a blast doing this one. Sometimes our jobs are just a total riot. We’re so lucky. I love this post. Weirdo Bella (my rag doll) is so picky about her food, but the old calico that belonged to Jerry’s dad that we inherited would love these. I’m looking forward to the dog post, too. Thanks so much Aly. I had so much fun doing this. It was a such a riot to work on. Evil Minx needs to come visit her cousins. Ha. Thanks so much Brandy. You need to give this a whirl. I wonder what Bennie would think of these? Ha. Such a cute idea! 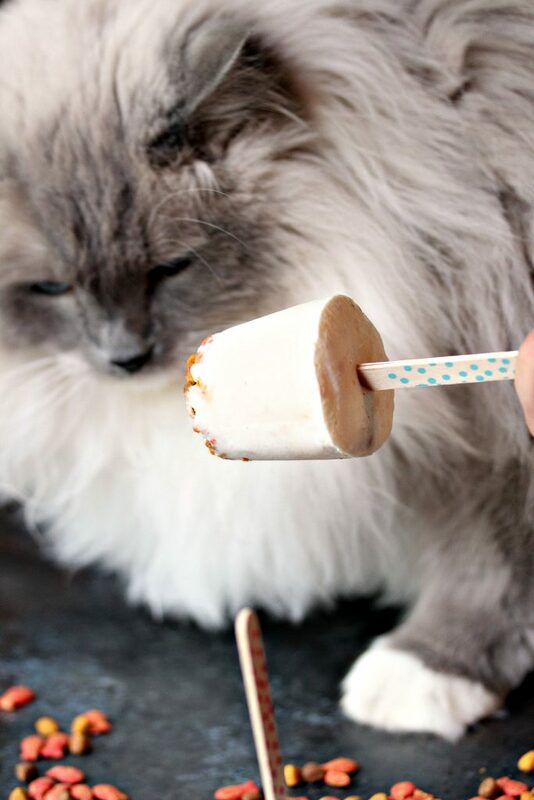 Cats should get dessert too! Thanks so much Christie. I completely agree. 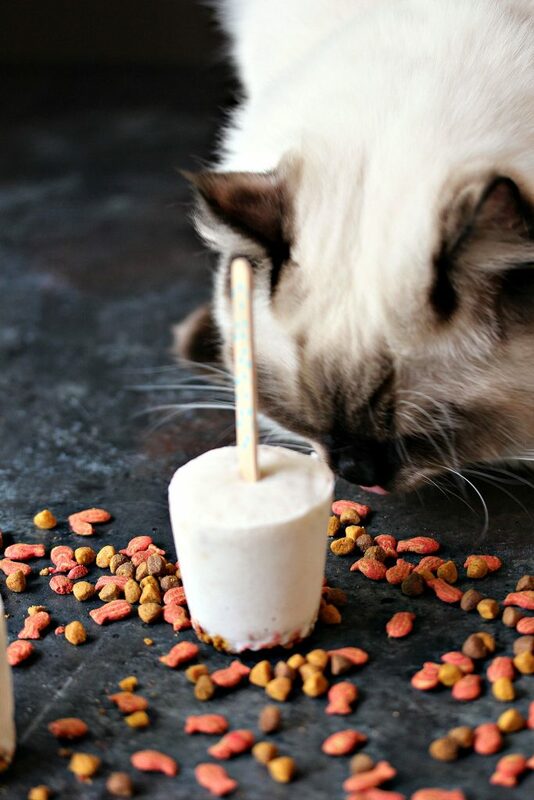 Aww, what kitty wouldn’t love getting this surprise treat?! Thanks for sharing your recipe with us at Merry Monday this week! Pets are so special! 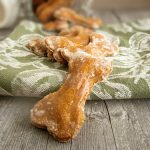 I never had cats but I loooove my dog – perhaps I adapt these treats to fit her diet?! 🙂 Your photos are gorgeous! What a truly unique post!